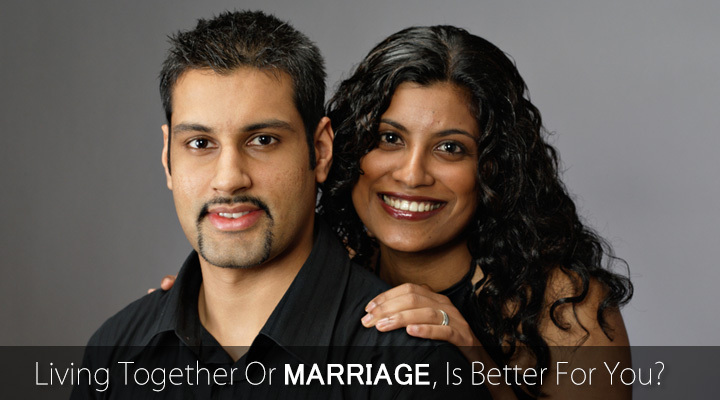 Living Together Or Marriage, Is Better For You? If you are contemplating between living together and getting married, you might be of the view that after all marriage is just a piece of paper. But the fact is that marriage is all about physical, emotional and spiritual amalgamation. It is a commitment to remain together. When you get into a relationship and consider living together, there is no serious commitment and is more of a ‘try out’ phase- if it works out, good, if it does not, we’ll move on. The relationship starts on a doubt and any little friction can widen the gap. Still thinking about living together or marriage is better for you? Consider this. When you get married, there is a strong commitment to be with each other through thick and thin. You don’t just hang on to see if things will work out. You ensure that frictions are resolved and there is compatibility, compromises and love, to have a happier future. Regardless of the stress and difficulties, both of the partners work on finding solutions. They sacrifice for the enhancement of the relationship. Comparing living-in and marriages, the fact that marriage brings in stability and commitment while living-in starts with a doubt about the success of the relationship. If you have a choice, what would you choose between staying in a secure, committed and long term relationship from the start or starting a relationship on ifs and buts, doubts and taking a chance that it might culminate in a marriage? Think rationally and then decide what will be better for your current and future prospects in life.